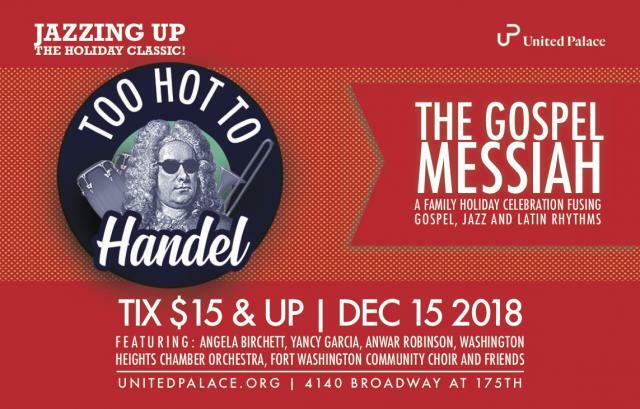 The United Palace brings a new holiday tradition to Washington Heights with Too Hot to Handel: The Gospel Messiah. Original Concept by Marin Alsop, co-Arranged by composers Bob Christianson & Gary Anderson. Infused with Latin rhythms, jazz improvisation, and gospel harmony, Too Hot to Handel has been hailed as "ingeniously re-imagined" by the Chicago Tribune and “perhaps the jazziest, most soulful reinterpretation of Handel’s Messiah you’ll ever hear” by The New York Post. 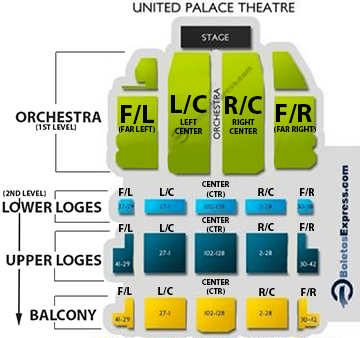 The United Palace adds a unique uptown vibe to the mix in a production that features the colorful and electric sounds of the Heights. Guest soloists include Angela Birchett (The Color Purple, Smokey Joe’s Café), Anwar Robinson (American Idol finalist, Rent) and up-and-comer Yancy Garcia. They will be joined by composer/conductor Chris Whittaker, the Washington Heights Chamber Orchestra, the Fort Washington Community Choir, and friends. Family friendly. 2.5 hours including intermission. Doors open at 1:30. Arrive early to beat the crowd! Espanol: El United Palace trae una nueva tradición navideña a Washington Heights con Too Hot to Handel: The Gospel Messiah. Con una infusión de ritmos latinos, improvisación de jazz y armonía evangélica, Too Hot to Handel ha sido calificada como "ingeniosamente re-imaginada" por el Chicago Tribune y "quizás la reinterpretación más ingeniosa y animosa del Mesías de Handel que jamás escuchará" por The New York Post. El United Palace agrega un ambiente de uptown único a la mezcla en una producción que presenta los sonidos coloridos y eléctricos de Heights. Entre los solistas invitados se encuentran Angela Birchett (The Color Purple, Smokey Joe's Café), Anwar Robinson (finalista de American Idol, Rent) y la actriz Yancy Garcia. A ellos se unirán el compositor / director de orquesta Chris Whittaker, la Orquesta de Cámara de Washington Heights, el Coro de la Comunidad de Fort Washington y amigos. Concepto Original de: Marin Alsop Co-arreglado por los compositores: Bob Christianson & Gary Anderson.